Some eye-popping alterations to photos of lilipads and water lilies create a somewhat psychedelic looking pond. 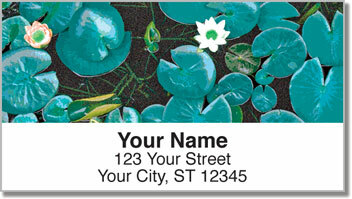 This flower-filled address label design is quite different from most of the other choices in our collection. The floating blooms seem to glow with electric colors. 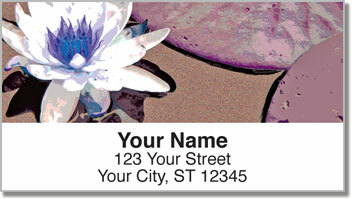 Tropical water lilies and lotus flowers are actually quite colorful floral family. You'll find them in blue, pink, yellow and more! You'll love the fantastic finishing touch for your mail, but you'll really appreciate how handy these labels can be in day to day life. 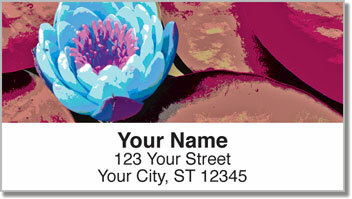 Instead of painstakingly printing your return address by hand, you just peel and place. That's thanks to a convenient, self-adhesive backing. 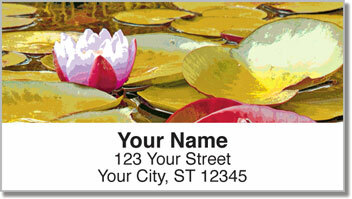 Order your own Wild Water Lily Address Labels today! Get them with a set of matching personal checks.